We’re very excited to be interviewing Ryan from Blogging From Paradise. He’s learned that living free and being happy in life is the way to go. He has learned how to make money online, how to get paid to write online and how to start a travel blog and this has completely changed his life. Through his online jobs and the fun travel jobs he’s explored, he’s been able to carve out a living for himself in paradise. Looking for ways to make money from home? Don’t miss our guide to making real money from paid online surveys. You can sign up in minutes and start earning online today. Hi Ryan! I obviously know who you are, but for those out there who don’t, can you please tell us a little bit about yourself and what your website is all about? Hi Nick and Dariece, thanks so much for interviewing me! My name is Ryan Biddulph. I’m a 39 year old ex-fired-security-guard turned full time professional blogger who owns Blogging from Paradise. I share tips for retiring to a life of island hopping through smart blogging. 5 years ago I faced a crossroads. I could keep doing the employee thing or I could begin prospering online. I went with the latter and my life’s purpose now is to help other folks retire to a life of island hopping through smart blogging, just like I did. 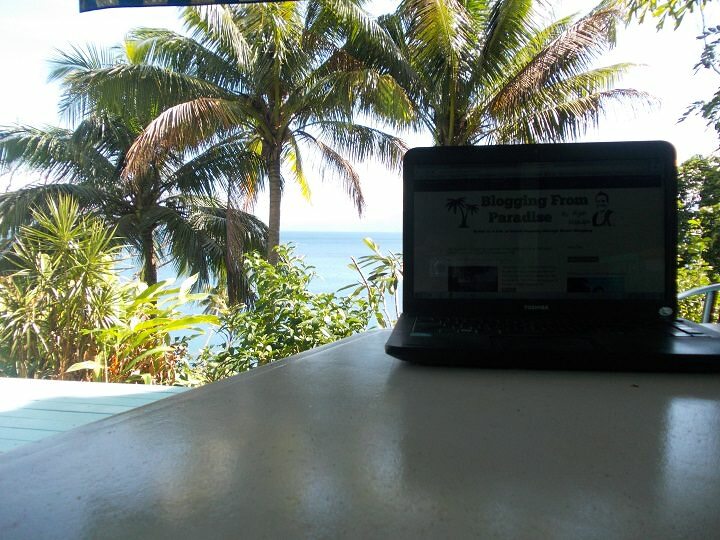 Your website, Blogging From Paradise, is so inspirational! Were you always interested in blogging/being an online presence? How did this profession come about? Thanks! I was interested in blogging for a few years and published my fair share of posts but the Blogging from Paradise brand came into form here in Savusavu, Fiji. My old blog – which saw some success, and helped me become a full-time, professional blogging, island hopping digital nomad – was yanked by my host. I decided to move in an authentic direction. My life was all about blogging, pretty much, and I was blogging from paradise, and I’m retired from the 9-5, so I decided to share the tips/stories/experiences which helped free me so I could help others do the same. I really believe if we just tell our life’s story and link it to our niche, success takes care of itself. I had to get clear on my blog’s topic; no hopping around between niches. I share smart blogging tips, and I also give clues into how to become a digital nomad, but I let go all of my inspirational/personal development themed posts to attract a targeted reader. Funny thing about getting clear; when you travel in one direction, like-minded folks will find you with increasing ease. How did you come to the realization that being free and living a location independent lifestyle was possible? I remember seeing other bloggers doing the full time bit. I saw their backgrounds; none started off as pro bloggers. Most worked in the corporate world, like you had, and like I did up until my security guard days. If they did it, I could. Then, as we were traveling, and made more money, I had some tangible proof to back up my assumption. As I became clearer and clearer on my intent, during our world travels, and I simply wanted to be more and more free, I worked inspired, created value, connected with leaders and naturally, my dream of being location independent became a reality. Years ago, the idea was impossible to me, then possible, then probable, then a certainty, then it manifested for me, through my clarity, and my intelligent, persistent work. What would be the #1 piece of advice you would give people who are “on the fence” about giving up their traditional lifestyle in search of something greater? Know why, and you better tie that why into being free. As you can imagine, a fired security guard had to overcome some obstacles, mental blocks, limiting beliefs and all types of other resistance to become a professional blogger, blogging from paradise. I always wanted to be free more than I feared doing uncomfortable stuff, so here I am. If you’re on the fence, remember this; your traditional lifestyle may render the illusion of security, but you can get fired in a minute. Then, that paradigm was shattered for you, courtesy of the Universe. As you slowly assess why you’re buying into your traditional lifestyle – if of course, you want something more freeing and fulfilling – you’ll realize all of your limiting beliefs are leased, given to you from parents, friends, and society, in some cases, and you can trade them in at any time. You must want to be free more than you fear giving up your office job, and when you realize that sacrifice is giving up what’s old and worn out, to make room for what’s new, exciting, and more freeing, for you, well, that realization’s momentum will carry you onward toward an exciting journey….just like I’m taking. We’re always looking for various ways to make money abroad so that we can share those ideas with our readers. I know that you’re selling a lifestyle on your site, but in which ways are you able to earn cold, hard cash from being a digital nomad? Like yourself, I’m a freelance writer, as is my fiancée Kelli. I also sell my Blogging from Paradise series eBooks (up to #4 now) to establish my credibility and to earn cash. I’m an affiliate for one product I’ve used for many months, and which helps me blog from paradise, and I’m also a blog coach who helps bloggers boost their traffic and income. I’m also open to new income streams and of course, we have retirement accounts and pensions to help grow our nest egg while we prosper through our blogs. You often talk about travelling at a slow pace, why do you enjoy this style of travel so much? I believe you can’t really see a place until you experience it. I know some may be strapped for time – which is EXACTLY why you want to think about doing the digital nomad bit – but you’re usually wasting your time and giving yourself an ego boost unless you spend more than a few weeks in one spot. If we lived in Savusavu, Fiji, for a week, we’d have seen a beautiful bay, and stunning ocean views, and maybe we’d have went on a few tours, and then we’d rush off to another paradise, without *feeling* much of anything. Instead, we lived here for 4 months. OK, we landed a 4 month house sit. Sweet, right? Anyway, we stay in most spots for a month, and here in Fiji we made friends with locals and expats, and we’ve learned much about living here, and we’ve seen all types of stuff and experienced all types of stuff which plain ain’t gonna happen if you’re living somewhere for a week. We seek an experience, not seeing something or visiting somewhere. 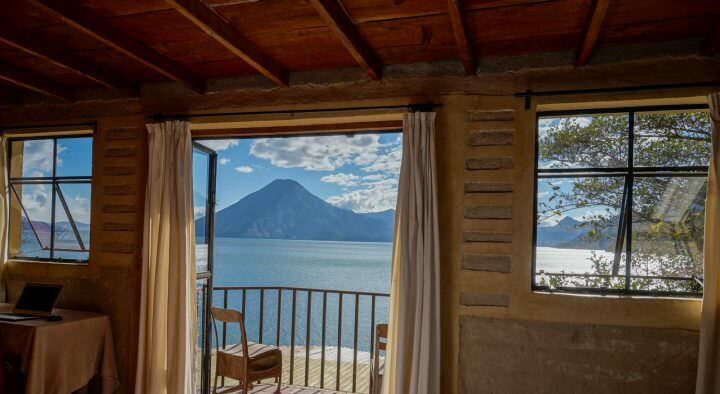 We want to feel something special, and being somewhere long term helps you feel something special by catching all the little details that hurried travelers miss. Your current paradise in Fiji looks and sounds amazing! We have always associated this country with being a very expensive place to travel to. Would you agree, or is it more budget friendly than I’m picturing? Actually, it’s been budget for us, lodging-wise, as we’re house sitting, but even in terms of food and travel, Savusavu is very reasonable. 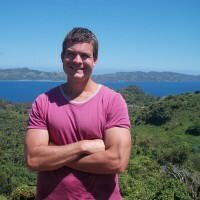 We get 2 Fijian dollars for every USD spent, and between buying food from the market, and the local grocery store, and traveling, this is a very inexpensive place to live. It’s not Thailand cheap – where is, right? – but it’s far more affordable than most folks think. We got a great deal on airfare, but you’ll have to pay a bit more to fly here because it’s in the middle of the Pacific Ocean. “No man’s land” usually means spending a bit more on airfare. How many paradises have you blogged from so far? Do you have a favourite?! Hmmm…I’d say: the whole of Costa Rica, Bali, Fiji, and Thailand are my favorite countries. My fave islands are: Bali, Phuket, Koh Lanta and Vanua Levu, Fiji. My favorite spot is a 3 way because I love all of them so much: Ubud, Bali, Phuket, Thailand and Chiang Mai, Thailand. Ubud is awesome, because we always live in the rice fields, or in the jungle, about 15 minutes away from town, but then you have Ubud center which rocks. Phuket is great because we live at the quiet but convenient southern tip, hitting up gorgeous Nai Harn Beach. We always stay in Rawai, which is a different experience (understatement) than Patong. Hey, I love Patong for Jungceylon, not hating. Chiang Mai is more of an urban paradise but it has all you could want, and again, we stay way outside of the heavily touristed area of town, in Chiang Mai Riverside Condos, in the south west part of the city. 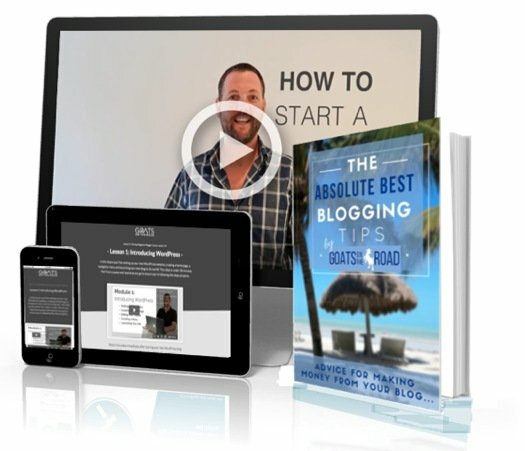 One of your awesome ebooks is titled “How My Wildest Travel Stories Can Help You Become A Successful Blogger”. Have you ever been scared for your life while travelling? 3 times: in Muhamma, India, after I lost 20 pounds in 2 weeks and became dangerously dehydrated after suffering from girdia, I thought I may just be dying…..
#3 would be stepping inside of a cage with three, 400 pound tigers in Thailand. I never felt so puny or tiny or weak in my life, and I’m kind of a strong, muscular, powerful dude. In any second, if they wanted me, these cats could have had me. No problems. 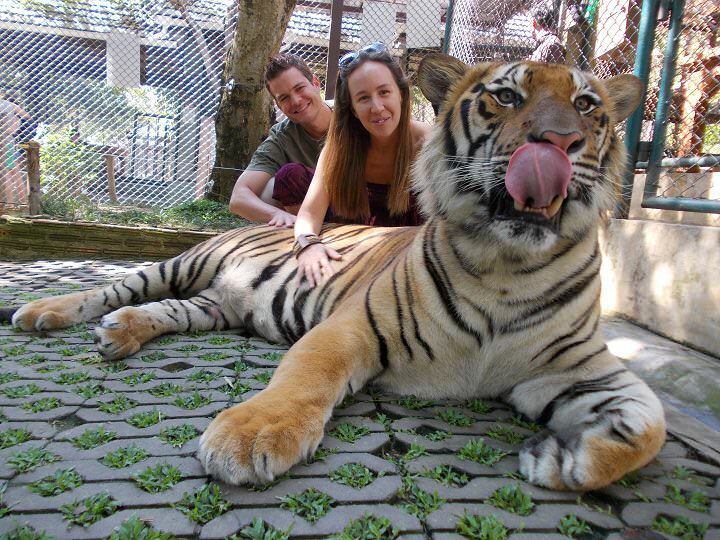 They were beyond chill but I knew that I was about 15 rungs lower on the food chain, in the cage with these beautiful creatures who were designed to kill creatures who weighed tons, so a farang at a buck 70 was nothing for them. What are your upcoming plans? Which paradise will you be blogging from next?! More Blogging from Paradise eBooks, more inspiring folks to retire to a life of island hopping, through smart blogging, and more traveling. Next month we’re visiting Ubud, Bali once again which will be a treat. Thanks so much guys, I SO appreciate you sharing this opportunity with me! 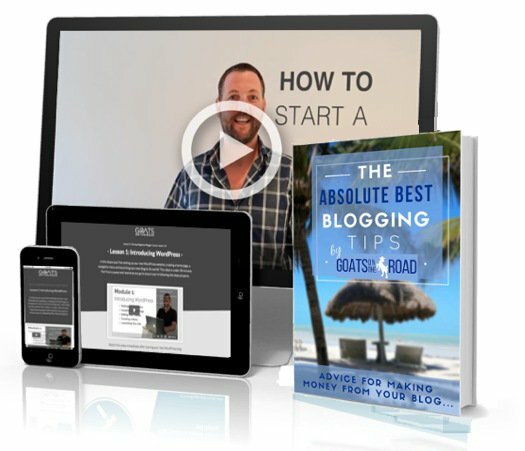 Ryan Biddulph is the author of the Blogging from Paradise eBook series, a full time blogger, coach and internet lifestyle junkie. Pick up Ryan’s eBooks by click here: Blogging from Paradise eBooks. Follow him on Google+ and Twitter. Thanks SO much for interviewing me! I’m beyond honored! Great interview! Those monkeys here in Costa Rica are really clever.. They end up with all kinds of good swag, cameras, backpacks, etc… Amazing photo with the Tiger. Going to follow this blogger for sure! Appreciate it! 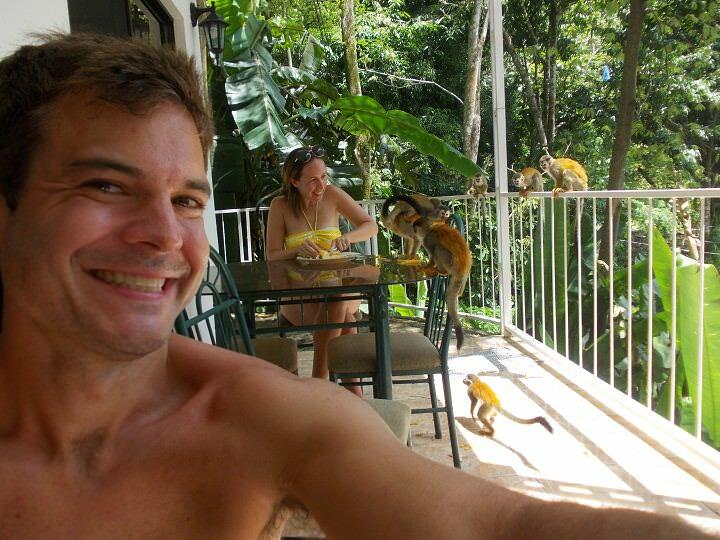 The monkeys are really cheeky; they went nutzo on the bananas we were feeding them. The ones in Bali, in Ubud, also steal all types of stuff. And yep, those tigers are impressive creatures, so beautiful, and so terrifyingly large 😉 Thanks again Jack! Monkeys are super cheeky! Everywhere we go, they always try to steal our stuff! One of them even started unzipping our backpack that we left on the beach while we went for a dip! Too funny. Thanks for the comment 🙂 Have a great day! Great interview, guys! Totally agree on slow travel. The only way to trully experience a place is to live there for awhile and get to know local people. would be awesome to quit 9-5, but it takes lots of courage to do it. We try to work on passive income that will eventually allow us to retire from 9-5. Thanks for inspiration! Ditto on that. I was just chatting with someone in town about the Fiji 7’s rugby victories yesterday. Such a neat experience, talking to the local folks about news events here, and making friends along the way. Thanks so much for reading. Once again I am busy reading your weekly newsletter.They are so interesting to read and so inspirational! I enjoyed reading your interview with Ryan Biddulph. He is certainly brave and inspirational too! I certainly wanted to become free of a 9 to 5 job, and indulge in my passion of travelling, but as I need some level of certainty of income, I have chosen to become a Native English language teacher. As of to date, I have taught in Vietnam, teaching kindergarten kids, primary school kids 5-14 yrs and University students, plus a little private tutition as well. I have followed that thru with a job in China teaching Middle School Students – Grade 1. There are 3 grades here. I have been here just over 6 weeks now. But before that I did 4 months travelling around to places such a Dehli in India to see the Taj Mahal, 3days, then on to Dubai and Tel Aviv for 3 days. From there I went to Spain where I spent 2 weeks in Barcelona, Alicante, Murcia and Madrid, followed by a quick trip to Paris to see The Louvre. From there I spent 2 weeks in Switzerland , followed by a few weeks in Hungary visiting relatives, and enjoying wonderful hospitality and great Hungarian food. After leaving Hungary, I toured Venice, then went over to Athens, Istanbul, Sofia, Bucharest, Salzburg and Dubrovnik and then back to Hungary before flying to Vietnam to do teaching in Saigon. This is now my 5th trip overseas, but as I am on a roll now, I ain’t going home anytime soon at least not for long. I am intending on travelling for at least another 2-3 years. This all at the tender age of 62yrs LOL!! ( I look 50 and act like a 50 year old too). I hope I can be an inspiration to some middle aged ladies who want to travel but are sacred too, or not sure how to go about it, or don’t know how they can support themselves while being away. Try teaching, its a great life. My only regret is that I wished that I had done it sooner. But better late than never. Well, this is all from me for now. Keep up your great posts, I love reading them. You have been to so many places that I haven’t thought of going to, but I might now that I know about them thru you guys. 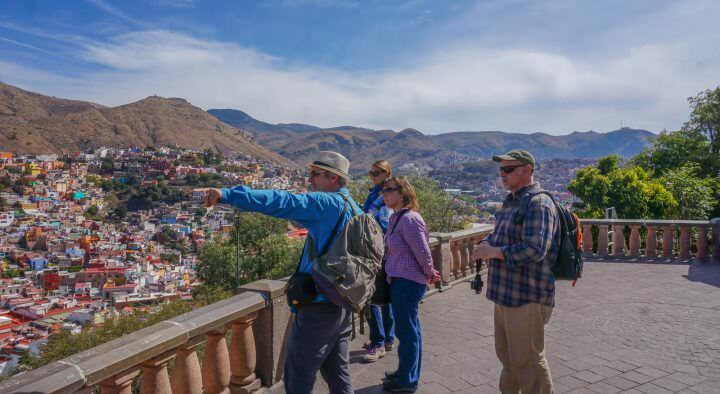 While the whirlwind tour was great and I saw some of the places that I had been dreaming of and more, I certainly have to agree that staying put in one place certainly gives you more insight as to how the locals live, which you miss when you are busy going around on sightseeing tours. So teaching enables you to get immersed in the local life and culture. Wow, you really are living the dream, hey? Like you said, better late than never for sure! I love that you are teaching English in China like we did 🙂 Which city are you living in? You’ve done some fantastic travelling, good for you – it doesn’t matter what age you are! Keep up the great travel spirit! Wow, you really have lived in some incredible places Ryan. 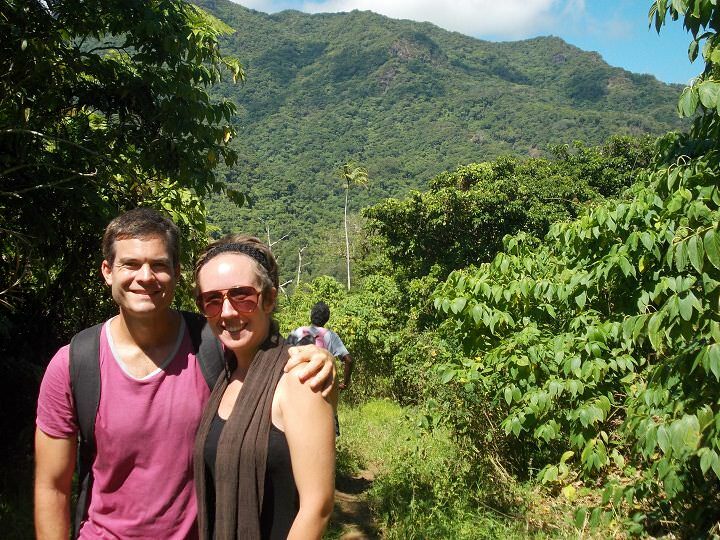 I’m glad you’re making money from your travels- it’s very inspirational to read about! I WANT TO GO BACK TO FIJI!!! Brilliant interview guys, well done. Of course I’m a regular on Ryan’s blog, and I admire him so much for taking ‘normal’ societal constructions and stamping all over them. While most of us abide by social norms in a truly passive way (Get an education, get a 9-5, have a family, retire at 60 and hope we have enough in our pensions to see us through), they just ripped it up and burnt it. And there’s a romanticism about this whole lifestyle concept that shines through each and every post . Not so much based on material elements, but purely based on experiences. Creating memories. It’s refreshing beyond belief. Thanks guys, and take care. Wow, this is so inspiring, especially for someone who has only recently set up their own blog! The advice about travelling slow. We have been on the road now and feel we want to slow down and settle for a period of time. Hopefully, in a paradise like Fiji. I hadn’t really given house sitting that much thought but it definitely has a lot of benefits. great interview that has given me a lot of food for thought.